Home > Just Listed in Tahoe Park! Just Listed in Tahoe Park! 232 Shoreview Dr. Wonderful, cozy cabin with a modern feel perched up on a hilltop, providing nice long sun exposure. The over sized one-car garage provides a nice work bench area. This property is located on a quiet street and is close proximity to Paige Meadows, where you can fill your days with great hiking! 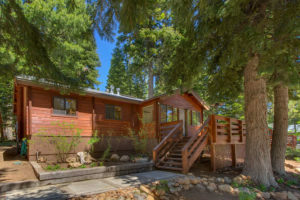 In highly desirable Lake Tahoe Park HOA– one of West Shore’s best beaches, as well as private picnic tables, activities, pier and buoy access. Convenient to Sunnyside, West Shore beaches and Tahoe City.